Retired and live on the mid coast of Maine. Numbskiull Thanks for the comments and link. The main reason i need to get my casting in order is I'm making my first fishing trip to the Cape. I'll be there the last week of May and will be staying at Nickerson Park. Hopefully the weather and fish will cooperate. You're going to have to tie those on behind a tree! Nice. Thanks for the info, I'm booked into Nickerson the last week of May. Thank you for the contact information I will give Steve a call this week. 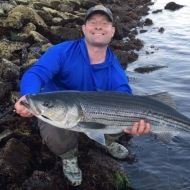 I'll be down to the Cape in mid April I'll stop in and introduce myself to Bob at Black Eel Outfitters. Where did you find the box? 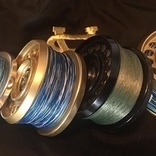 Fly reel drag strength..how much?